The role of our Governing Body is based on three core functions: Challenge – to hold the Head teacher to account for the educational performance of the school; Strategy – setting the strategic direction and Budget – ensuring financial health, probity and value for money. The Governing Body acts as a critical friend of the school. It works closely with the Head teacher and Senior Leaders to make decisions collectively as a team. Governors conduct their business through meetings, using relevant documents and advice and guidance from the Head teacher. Full Governing Body meetings take place termly. Committee meetings take place twice a term; one for Curriculum and Personnel and one for Finance, Premises and Resources. I have been Chair of Governors at Parkhill Junior School for 5 years and have been a member of the governing body for 9 years. I am also the Chair of Governors for the Beal Business Innovation Hub. 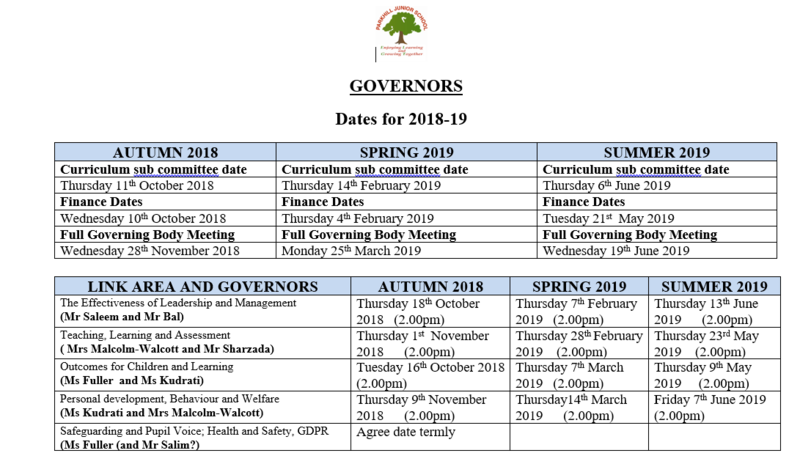 As a governor I have the opportunity to spend time in schools talking to the staff and children, this helps me to gain insight into whether the agreed policies and procedures are working for the school community. I have a background in safeguarding and working with vulnerable families and have worked for a neighbouring local authority for many years. I have been a Governor at Parkhill Junior for the last 4 years so. I have lived in the Clayhall area since 1996 and in Ilford all my life. My son attended Parkhill Junior as does my Daughter now. By trade I am Programme Manager for Global Service Provider. I chose to become a Governor to actively input into the educational welfare of our children to ensure our they not only get a first class education but an enjoyable one as well, so that when they leave Parkhill they are well equipped to be model citizens in our community and be ready for next chapter in their lives. I am always happy to talk to anyone if they have any concerns – so please feel free to talk to me anytime. I am a parent of a young child with additional needs who attends the school, consequently I have a keen and vested interest in the development and improvement of this school. The educational opportunities available to children is an area I feel very passionate about, hence I am keen to expand my understanding of education, and positively contribute in practical ways, using my skills and experience. I am also a qualified solicitor advocate, with Education Law being one of my two specialist areas, I am fully aware of the challenges faced by schools, pupils and their families. My previous experience of being a parent governor of a special school within the borough, includes chairing sub committees, attending consultative meetings with LEA departments, preparing for Ofsted inspections, meeting with inspectors and undertaking staff interviews and appraisals. This role has given me some valuable insights into the value of good school governance. Redbridge is anything but dull, with such a rich culturally diverse community. I have always been a promoter of education. I strongly believe primary education is the foundation of any successful society. It is all the more a privilege to serve as a governor in Parkhill Juniors. I am married with two children and read Mathematics at University. My professional background is in the financial world. Children are our future and through an approach of continuous improvement, the team at Parkhill Junior School plays an important part in shaping and enriching the lives of our future generation. My passion as a Local Authority School Governor feeds my early interests in mentoring children to help them realise their full potential. I enjoy the challenge of working collaboratively to help children develop and grow into mature responsible adults. Through my work as a Finance Manager, I also understand how good financial awareness and sound business acumen can help strengthen performance and help investment in the future. My experience in other areas of business such as Law, Health and Safety and as a Disciplinary Committee member has helped me understand and appreciate the variety of skills that a diverse team brings to every organisation. As a School Governor I want to make a strong contribution to my local community and help every child secure a brighter future. My name is Harminder Bal, I have two children proudly attending Parkhill Junior School. What I will do as a School governor? As an executive manager working for Royal Mail in London, I have vast experience of Leadership of National, international logistics, manufacturing plants and Quality Control within the world class manufacturing association. With my professional experience I would make a positive impact within the school, in supporting the interests of all parents and children whilst ensuring the school is successful and accountable at every level. I will make myself visible to parents, represent your concerns in the management of the school. I have been a teacher at Parkhill Junior School for six years and have taught in both upper and lower Key Stage 2. I am also the Humanities lead for the school and as part of my leadership role conduct interviews with pupils and evaluations with staff. This gives me great insight into the fantastic learning opportunities that are happening across all year groups. I am passionate about the importance of high-quality education and believe that my new role as a school governor and curriculum sub-committee member will enable me to represent the staff and teachers at Parkhill Junior School, whilst offering an experienced understanding of how to help every child reach their full potential through ambition and aspiration.